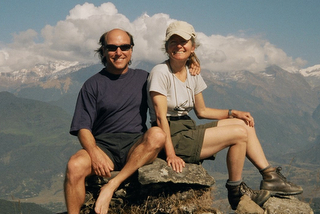 About ten years ago my husband and I decided to celebrate our 50th birthdays and 30th anniversary by spending four months in Nepal learning to paraglide. It was an amazing, and yes, frightening experience. Some days we would be circling in the sky with huge eagles and buzzards close enough to touch, beautiful Lake Thewa sparkling thousands of feet below us, and massive 25,000 foot peaks dominating the horizon. Truly, a life-changing adventure. Little did we know. On the morning of Christmas Eve, I launched off the hill for my 52nd flight, leaving my husband and a friend standing on the cliff as I flew down the ridge and out of sight. I didn’t know it would be fifteen minutes before wind conditions would allow them to take off. And they didn’t know I was about to crash near the landing site and break my back. I lay in a crumpled heap in a rice paddy at the bottom of a cliff. I couldn’t stand. The slightest movement brought agonizing spasms. Local children and women huddled around me but didn’t know what to do. A dog licked my face. I saw a vision in the clouds – my mother’s face showing shock and concern, and filling me with love. Twenty minutes later my husband landed nearby, ripped himself out of his harness and raced over. Another paragliding friend arrived shortly after. There was no ambulance, no helicopter, no emergency service to call, so they very carefully got me up the hill and to a taxi. I refused to go to the hospital, insisting they take me back to our hotel instead. 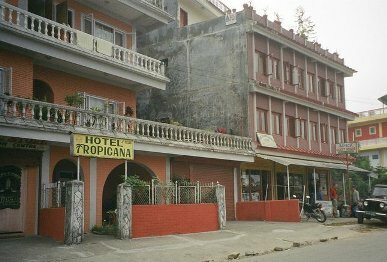 Which is why I was sitting on the fourth-floor terrace of our hotel two hours later, fighting off spasms and fear, when gunfire erupted in the street below as Maoist guerrillas attacked a police checkpoint in front of our hotel. At first it sounded like fireworks. But then women started screaming and someone yelled, “They’re killing each other! They’re killing each other!” I started sobbing and tried to get out of my chair. My husband dragged the chair with me in it off the terrace and back into the safety of our room. It was Christmas Eve, 2004. 4th-floor terrace we were on when the Maoist guerillas attacked the police checkpoint directly below us on the street and the bullets started flying. 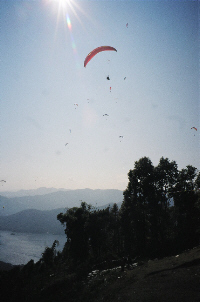 They said no paragliding for two weeks, but other than that, expressed little concern. 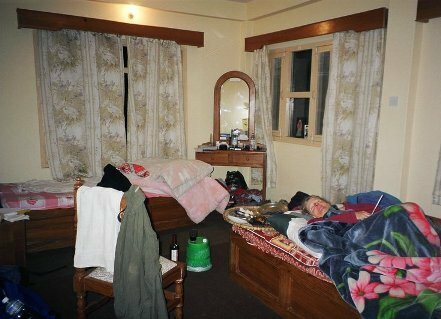 So ten days later we were still in Nepal and I was well on my way to recovery (and more flying, I thought), when we got word that my mother-in-law had just passed away after a long illness. 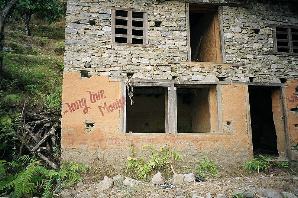 Then, the next day, the King of Nepal declared martial law and locked down the country because of the war happening around us. He closed the airports, and cut off all phone and internet service indefinitely. We were stranded with no way out of the country. We tried to be as philosophical as possible about our circumstances, but a few days later we were once again pushed up against the wall when a visiting Swiss Radiologist happened to have a look at my x-rays. 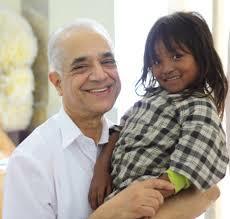 Our journey instantly took another twist: it became a tour of medical facilities in Nepal. And there was nothing anyone could do: I would have to see a neurosurgeon as soon as I returned to Canada. Suddenly, every pothole in the road became a mortal enemy. Every twinge from my back came with a vision of life in a wheelchair. Every moment of not knowing what was in store sucked emotional energy from my husband and me like a giant black hole. And then we met Dr. Banskota, an American-trained orthopedic surgeon who runs a hospital in Kathmandu where they do free surgery on underprivileged children with terrible deformities whose parents could never afford the operations. transformed. For the first time in many days, we had hope. The next day, we flew to Europe. And several days after that, we were back in Vancouver. 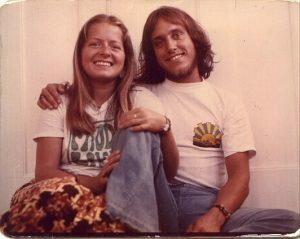 My husband and I had gone through the most intense five months of our thirty years together. 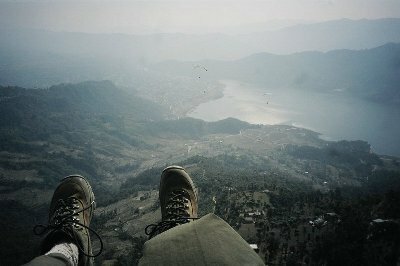 We had floated in the air thousands of feet above the earth. We had witnessed death, been touched deeply by it, and come closer to losing each other than ever before. And we had come out of it closer than ever before. A friend later insisted, “I knew that trip was going to be a disaster for you.” But we don’t look at it that way at all. In fact, it is still our favorite journey ever. And when people look at me today they have no clue of how close I came to dying or life in a wheelchair. But I do my best to never forget. Van and I have been together now for over forty years now, and many of those were spent on the road, traveling and living overseas. But this adventure, celebrating our fiftieth year on the planet, was our most memorable. It changed everything. And we don’t regret it one bit. 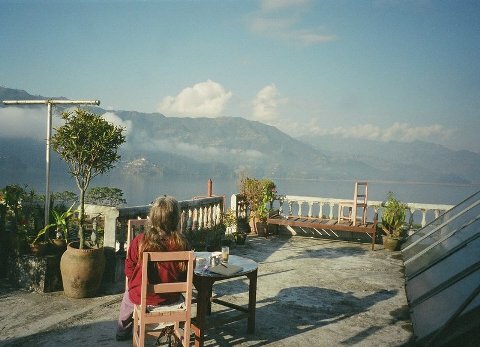 In Pokhara, Nepal, 2004, just before Christmas Eve! © 2019 Mind Body Fitness, Inc. *PLEASE NOTE: All the material on this site is for general information and education purposes only. You should always consult with your physician and other health care providers before making any decisions that might affect your health.